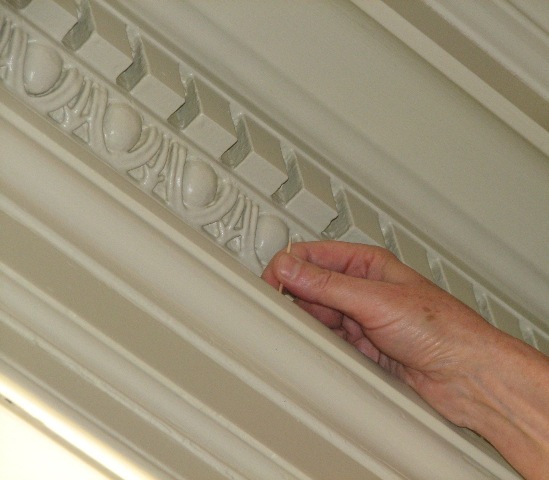 The Montpelier Curatorial and Restoration Blog has combined with the other Montpelier blogs into one fantastic source! Come read all of the blogs – on archaeology, forestry, gardens, slavery, restoration and more – at the new site. If you only want to see what Curatorial is up to, you can visit our section of the new blog. This blog will remain up for now, but all of our new content will be posted at the new location. Thank you for your continuing interest and support of Montpelier! Please bookmark the Montpelier blog as a favorite or use a rss reader to keep up with all of the most recent discoveries as we continue our Presidential Detective Story. 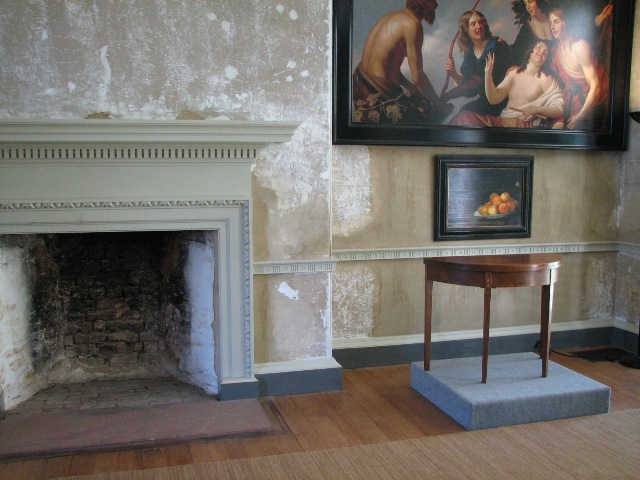 Last week, Susan Buck, Architectural Finishes Conservator, visited Montpelier to continue work on two ongoing projects in the drawing room (M108): the search for curtain hanging evidence and the hunt for clues about the original wallpaper. Small wooden markers show the depth and angle of nail holes, which might have been used to secure drapery hardware. One Madison era visitor mentioned the windows in the drawing room were “hung with light silken drapery.” But, how were the curtains suspended and what design did the Madisons choose? It’s a big deal to go to the White House. But it’s an even bigger deal to go to the White House to honor a family member. Montpelier organized a private White House visit this past Monday for Paul Jennings’ descendants. Jennings, James and Dolley Madison’s former slave, helped Dolley rescue the Gilbert Stuart Landsdowne portrait of George Washington before the British burned the White House during the War of 1812. The visit fell on the 195th anniversary of the portrait’s rescue. This story already generated a buzz with the New York Times and Philadelphia Inquirer. So, on Monday, 27 of Jennings’ family members passed through the White House front gates, a camera crew in tow, to honor their ancestor’s heroic contribution to saving a national treasure. President Barack Obama made headlines when he gave Queen Elizabeth II an ipod. Montpelier had its own unique gift for the President, who was on vacation at the time: a nail fashioned by Montpelier slaves, encased in a beautiful wooden box that was carved from trees at Montpelier. Michael Quinn, Montpelier’s president, and Beth Taylor, Montpelier’s research associate and Paul Jennings expert presented the gift to William G. Allman, White House curator. 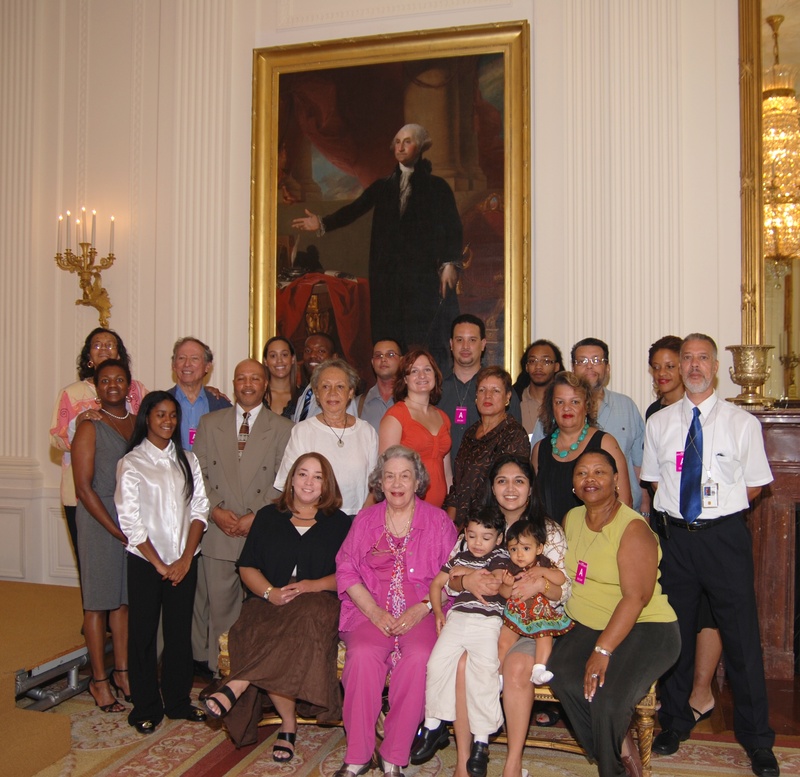 Allman led the family to the East Room to see the famed Washington portrait. They also visited the Green, Blue, and Red Rooms, and State Dining Room. After the White House visit, the VIP treatment continued with a rare opportunity to go inside the Dolley Madison House, now owned by the U.S. Court of Appeals. Jennings is on his way to becoming a household name. Check out CBS Evening News, National Public Radio’s “All Things Considered,” The Washington Post, and Politico’s “44” blog. The Free Lance-Star also gave a great local write-up. The Jennings descendants gather in front of the portrait their ancestor helped Dolley Madison save 195 years ago. Paul Jennings is on his way to becoming a household name thanks to Sunday’s New York Times article. Paul Jennings was born a slave at Montpelier and helped Dolley Madison rescue George Washington’s portrait before the British burned the White House during the War of 1812. In fact Monday, August 24 will mark the 195th anniversary of the portrait’s rescue. Jennings went on to achieve his freedom, become a prominent abolitionist and Washington D.C. resident, and work in the U.S. Pension Office. Dr. Beth Taylor, Montpelier’s research associate has been conducting original Jennings research. Paul Jennings’ life shows a quintessentially American story, with remarkable twists and turns that reveal an extraordinary sweep of our history in one single lifetime. Through Jennings and his descendants we see the road from slavery to citizenship; the role African-Americans played in the early White House; how freed slaves came to settle and work in an integrated Washington, D.C., newly established as the nation’s capital; the complicated relationship between the Father of the Constitution and his enslaved manservant; the story of the first White House memoirist; how a Montpelier slave became an abolitionist and tried to free slaves aboard The Pearl; and how African-Americans are re-discovering their own American history. Check out The New York Times. In June, we briefly mentioned Paul Jennings, who was a slave of the Madisons and, after gaining his freedom, a notable member of the African-American community in Washington, D.C. Here at Montpelier, Beth Taylor has been conducting extensive research into the life of Paul Jennings. She will be periodically posting vignettes from her research, starting with this post on Jennings’ marriage. One of Paul Jennings’ duties as a manservant was to accompany the retired James Madison wherever he went. This meant that Jennings met his counterparts at the various plantations to which they traveled, and that these same manservants and lady’s maids would accompany their masters and mistresses to Montpelier. This may well have been the way in which Paul Jennings had the opportunity to meet and court his future wife, Fanny Gordon. When Paul Jennings met her, Fanny Gordon was lady’s maid to Mrs. Charles P. Howard. Mrs. Howard was born Jane Taylor at Greenfield outside the town of Orange, the daughter of Erasmus and Jane Moore Taylor; Fanny was born at Greenfield, but some three decades after Jane. Erasmus Taylor died in 1794, a year after Jane married Charles P. Howard. In the 1795 inventory of slaves following Erasmus’ death, there is no mention of anyone named Fanny. However, in a document establishing the final distribution of slaves in 1800, the name Fanny appears along with a few other new names clearly belonging to children born in the five years since Taylor’s death. Judging by her listed worth at £18, Fanny was probably born about 1798. After his marriage, Charles P. Howard, a Quaker from Philadelphia, found himself not only living in the south and husband to a Virginian but the owner of ten slaves. As the years went by, that number grew as children were born, and the Howards and their enslaved families settled on an 890-acre estate known as Howard Place, which bordered Montpelier. Despite the fact that the marriage had the consent of their masters, the couple did not live together. Paul at Montpelier was an hour or more walk from Fanny at Howard Place. With his attendance on Mr. Madison so constant, it is likely that he only traveled to see her once weekly, probably on Saturday evening to spend all of Sunday together. Traditionally, Sunday was the one day slaves did not have to work. Paul and Fanny’s marriage persisted, despite these challenges, and they had children. Keep an eye on the blog for more on Paul Jennings and his family as Beth Taylor continues her research. 1Deposition of Edmund Spotsey, 1896, Franklin Jennings vs. Elizabeth Webb; Case File #470; General Docket Records; Records of the United States Court of Appeals, District of Columbia; Record Group 276; National Archives Building, Washington, D.C.
Last week we installed a pair of card tables in the Drawing Room (M108) that have excellent Montpelier provenance. Card playing, backgammon, and other games were popular pastimes during the late 18th and early 19th century. Several visitors recalled seeing games being played during their visit with the Madisons. During his 1816 visit, Baron de Montelzun mentioned games of chess being played at Montpelier.1 In an exchange of letters between Dolley Madison and her sister Anna Payne Cutts in the spring of 1804, they mention playing Loo, a card game similar to the modern game of Hearts. The tables were purchased at an undated Montpelier sale by a local family who lived at a neighboring plantation. In the mid 20th century, the tables were separated when one was sold. 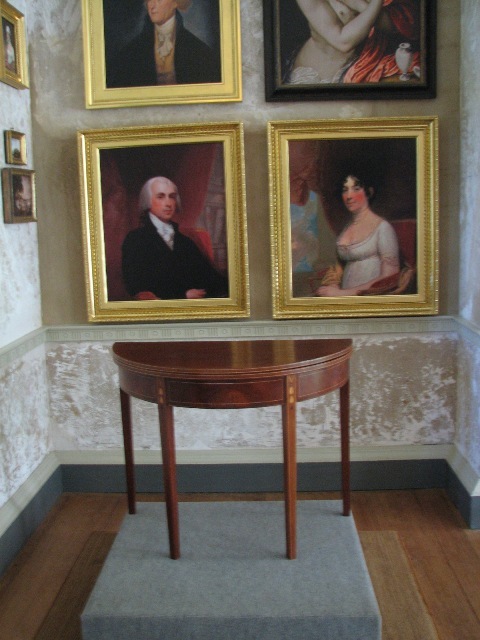 Both tables maintained their Madison provenance and were brought together for display here at Montpelier after it was confirmed that they were a matching pair. As part of our research, wood sampling was conducted on the tables, indicating they were made in New England based on the types of wood used. It is possible that these tables were shipped to Virginia or were acquired by the Madisons in Philadelphia, a port city with a thriving furniture trade. One of the tables was graciously donated to Montpelier by Mr. and Mrs. Randolph Thompson, and the other is currently on loan to us. We are thrilled to be able to display them together in situ. The Zantzinger memorandum gives us an idea of Dolley’s tastes, and her budget. She wants nice looking glasses and good carpet, but only as fine as can be purchased for $100 each. This was not a spending spree; Dolley was instead a savvy shopper who set a limit on the lengths to which she, or her agent, should go to acquire fashionable decorations for the house. Although she does not set an upper limit for the “print of the bust of N. Bonaparte” listed, she does quote Zantzinger the price that the print was selling for “some months since;” she did at least have an estimate for how much it should cost. The first is the Philadelphia merchant firm of Kepple and Zantzinger. Although the memorandum does not appear to date from the period when the Madisons were living in Philadelphia, they may have kept in touch with useful connections in that city. The firm of Kepple and Zantzinger would have had at least one Mr. Zantzinger in it. The second possibility is one William P. Zantzinger, supercargo, mentioned in a 1819 Supreme Court case. A supercargo is “An officer on a merchant ship who has charge of the cargo and its sale and purchase” ([italic]American Heritage Dictionary), so this Zantzinger would have been in a position to make purchases for the Madisons. Of course, it is possible that William P. Zantzinger was somehow related to the Zantzingers of the merchant firm in Philadelphia; in a letter to a friend written in Tripoli, Dolley Madison’s brother mentions having met “Mr. Zantzinger Supercargo of a vessel from Philadelphia” while in Italy. [note: John Coles Payne to Boyd, May 25, 1807, Private Collection] Merchant firms in the late 18th and early 19th centuries sometimes included extended families – fathers, sons, cousins, nephews – so a supercargo from Philadelphia could be related to a Philadelphia firm. The memorandum helps us to better understand Dolley Madison’s taste, the limits of her pocketbook and her desire to acquire certain goods in France. But, it also raises further questions about the Madisons’ patterns of consumption, who they used as agents for long-distance shopping and how they made those connections. We hope that you can come and see this document and other Madison items in our Grills Gallery. 2 Mary Lee Mann, A Yankee Jeffersonian: Selections from the Diary and Letters of William Lee of Massachusetts Written from 1796 to 1840, Cambridge, MA, 1958, p. 133. In an earlier post, we explained the concept of “provenance,” and how we use it here at Montpelier. Tracking down an object’s provenance often requires documentary research. In this post, we would like to expand on a type of research we touched on in our last post – documentary research with court records, and how it is helping us better understand the Madisons and their lives at Montpelier. Court records provide us with a unique approach to comprehending the Madison family through legal transactions. We utilize probate records such as wills, inventories and accounts of estate sales for many Madison family members to create a better understanding of what each person inherited, owned, bought and sold. 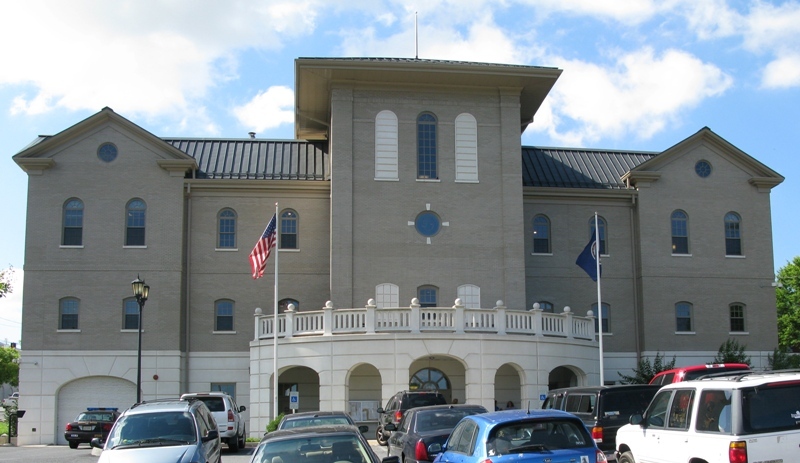 We then build on this knowledge by examining the records of lawsuits for Orange County, Virginia which are housed at several repositories across the state, including the Orange County Courthouse, the Library of Virginia, and the State Record Center. These records are spread across several courts, for example, courts for different jurisdictions, such as county and district. Making this a bit more difficult are changes to the structure of the court system itself as the 19th century progressed. Since we want to collect all information possible for James and Dolley Madison, his parents, her son John Payne Todd, and other close family members, we are systematically going through the records of each court in chronological order. It is a slow process, but more thorough than relying just on indexes or making random searches on years of suspected activity. While we are specifically interested in mentions of furniture and interior decoration in our current research, we record all cases for future reference. We have uncovered many court cases that have helped shed light on the history of the Madisons, their changing financial status, the individuals with whom they did business, their slaves, and so much more. One interesting case involved Dolley Madison and a merchant named Thomas Vial. He brought suit against her for nonpayment of accounts, submitting as evidence a list of all the items she had purchased from him in 1842 and 1843. This list provides us with information on what types of beverages and food she purchased. It also raises more questions for us: Did Dolley buy items from Mr. Vial in other years? If so, were her purchases for entertainment or for the everyday management of the household? Do any records of Thomas Vial’s business survive? In this manner, court documents can provide answers as well as questions that will hopefully lead to further discoveries. Although July 4 was not designated as a federal holiday for almost a hundred years after the Declaration of Independence was signed and drafted, it was considered by some a day of celebration from the very first anniversary. The way people chose to celebrate varied from place to place, some holding big parties and others holding prayer meetings. Two hundred years ago, on July 4, 1809, citizens of the town of Pittsfield, Vermont, chose to celebrate the anniversary of American Independence by writing a letter to their President, James Madison. That letter now belongs to the Library of Congress, and you can see and read it for yourself. The language of the letter is more formal, and certainly more flowery, than most people today would use, even when writing to the President. The underlying message, on the other hand, still applies today. While these citizens of Pittsfield voted for James Madison, and wanted him to succeed, they closed their letter by celebrating the “Sovreign Lord” of the United States: the People.